Below you’ll find the canonical reference for Halloween email planning. From email examples to specific promotional strategies, we’ve included everything you need to ace your campaign. Here's a great sneak-peek email that lets its customers know it's okay to get excited about Halloween even in the full heat of summer. We like the approach this email took for it's promotion — $9.99 delivered definitely lends itself to that impulse buying they're after. Everything clicks in this email: the clever animation, the simple design, the call to action that says "Get inspired" and the prominent "Find a Store" button. 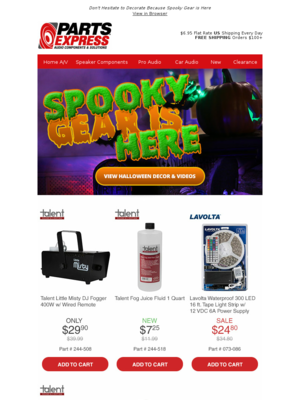 Track this company in MailCharts to see a company that gets everything right about Halloween. This email wins for its strapline: "If you've got it, haunt it!" No need for "spook-tacular." Extra points for putting in the preheader, too. 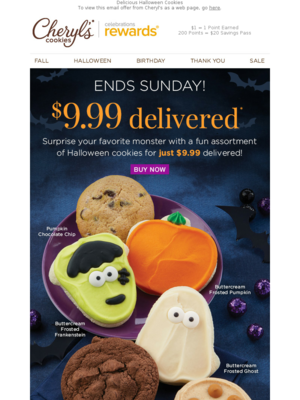 This email shows how to tie your business to the Halloween band wagon even if it isn't conventionally associated with the holiday. Also note the top item is inspiration, not promotion. 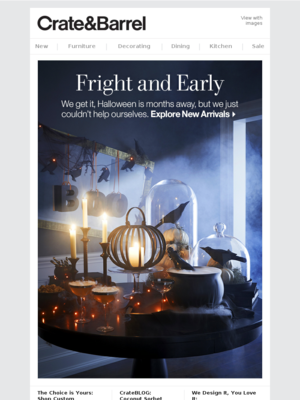 Start planning your Halloween email strategy with great examples. 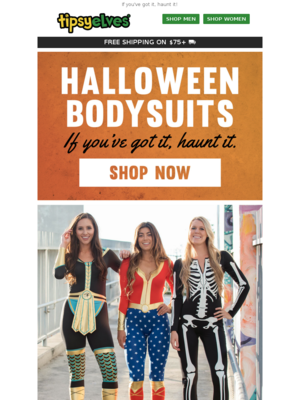 This Tipsy Elves email calendar is based on Tipsy Elves, who sent 6 emails for Halloween in 2018. This Yoogi's Closet email calendar is based on Yoogi's Closet, who sent 0 emails for Halloween in 2018. This NYDJ email calendar is based on NYDJ, who sent 0 emails for Halloween in 2018. Will you simply send one email on Halloween or will you send a few emails leading up to it, including a “last chance” email once the event is over? Based on 2841 emails mentioning "halloween", "pumpkin", "lantern" in the subject line. Discover the most popular types of promotions used for Halloween. Understand how steep a discount companies offer for Halloween. You can toggle between Dollars Off and Percent Off. 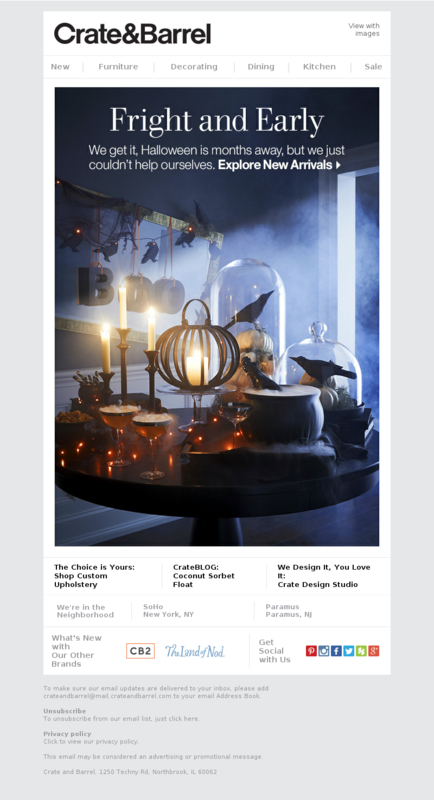 Ace your Halloween email content with these ready-to-implement strategies. Enjoy! Everybody’s getting in on Halloween, from infants to adults, parents to pets. If you want to claim your share of this $9 billion holiday, your email strategy must evolve to reflect this new reality. Halloween is all about creativity – costuming, decorating, celebrating. Creativity will help your emails stand out in a crowded inbox, too. These strategies can give you the edge that gets your emails noticed, opened and acted on. Adults aren’t embarrassed to admit they love Halloween. Capitalize on the excitement by publicizing sneak peeks, VIP content and special offers at the same time your summer campaigns are running. Whether you cater to the creepy, the cool or the clever crowds, be enthusiastic and invite your customer to share your excitement. Use your emails to remind customers about order deadlines so their party supplies, costumes, decor and other purchases arrive on time. Have a last- minute plan that helps out procrastinators and other desperate customers. 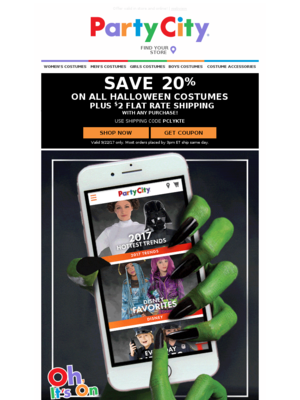 Add content to your emails that enriches your customer’s experience, such as ideas for unusual and attention-getting costumes, party themes and tips, or indoor and outdoor decorating ideas that make them the envy of their friends and neighbors. Excise “spook-tacular,” “boo-tiful” and “no tricks, just treats” from your marketing lexicon. Please. Everyone uses them. Or, search for Halloween emails in the MailCharts app and click the “Inbox” view to focus on the subject line. Carved-pumpkin emoji are popular, for good reason – they’re easy to see on all screen sizes. But that popularity can reduce its effectiveness. Explore others but avoid intricate designs.